Apple Computer on Saturday started selling the iPad tablet, a handheld device through which users can view movies, surf the Internet, read e-books and play games. 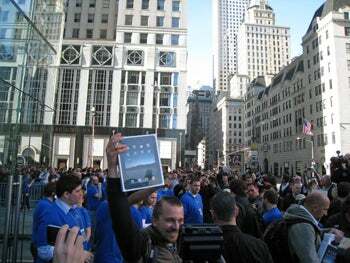 Lines formed outside the Apple store in New York with customers eager to purchase the product, which is one of the most hotly anticipated devices since the iPhone was launched in 2007. The lines weren't as long as they were for the iPhone, but buyers seemed ecstatic after getting the iPad in their hands. 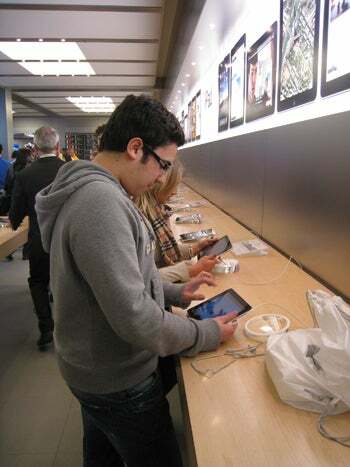 An instructor at New York University, Matthew Knell, waited in line for a few hours to purchase the device. He plans to use the it for entertainment and to read e-books to replace loads of print textbooks he otherwise carries. "It offers the opportunity to mix music, movies and books in one good personal-sized package. It does a lot of things the laptops do well, and it has the opportunity to change the way we consume media," Knell said. The iPads that went on sale Saturday include Wi-Fi, and are priced ranging from US$499 to $699, depending on storage capabilities, which range from 16GB to 64GB. Models becoming available later this month will include 3G mobile broadband, and will cost from $629 to $829. The device should be available worldwide by April, Apple CEO Steve Jobs said during the device's launch event in late January. AT&T will provide no-contract 3G service in the U.S., with a 250MB data plan costing $14.99 per month, and an unlimited plan costing $29.99. International deals for 3G services should be in place by June or July, the company has said. The iPad has been called a supersized iPod Touch, with a 9.7-inch touchscreen and an on-screen keyboard for typing. The device runs on Apple's A4 chip and can play back 720p high-definition video. Apple's iWork productivity application is included for those who wish to create documents, spreadsheets or presentations. The iPad was declared a success even prior to retail launch. Apple watchers suggest that hundreds of thousands of customers have already preordered the device from Apple's Web site. Market research firm iSuppli on Friday estimated that close to seven million iPads would ship by the end of the year. The device has received positive reviews for its long battery life, multimedia capabilities and e-book reading features. Analysts have also said the iPad could impact content distribution and spawn new ways to deliver video, news and e-books with specialized interfaces. The device also excels in Internet and surfing, which could affect the sales of devices like netbooks, analysts said. However, some potential customers argue, that the iPad has drawbacks, including the lack of a video camera, USB ports and support for Flash, which enables video on the Internet. Julian Scholl, CEO of advertising firm Zum Goldenen Hirschen, said he would like to use Skype for videoconferencing through the iPad. The lack of a video camera affects those capabilities. But he plans to buy the product in the next month when the iPad is released in Germany as the Apple products are important to the advertising industry. Many of the buyers lining up to purchase the device were owners of Apple products including the iPhone and Macbook. Users will be able to connect to Apple's iTunes stores to purchase music, movies and TV shows. Close to 8,500 movies will be available for the iPad, including more than 2,500 in high definition, said Brian Marshall, an analyst at Broadpoint Amtech this week. More than 55,000 TV show episodes will be available and CBS and ABC will stream shows to the iPad. Electronic textbooks will be available from McGraw-Hill, Houghton Mifflin, Pearson and Kaplan. News and magazine content will be provided by publishers including The New York Times, the Wall Street Journal and Associated Press. Apple is also taking orders for an attachable keyboard so users can type long documents, and a dock for the iPad to function as a monitor. The other accessories include a case, camera connection kit and USB power adapter.